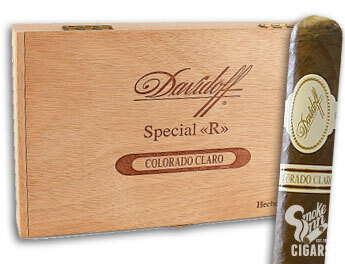 Since the mid-1990s, Davidoff has occasionally introduced into the market a rare product known as Davidoff Colorado Claro. This collection builds on existing Davidoff blends (e.g. Davidoff Aniversario, Double 'R', Special 'T', etc. ), using the cigar's core recipe and replacing the traditionally mild wrapper with a rare sun-grown variety. While most classic "White Label" Davidoff cigars make use of a soft and golden-hued Ecuadorian Connecticut Shade wrapper, the Davidoff Colorado Claro replaces this leaf with something much darker. This is because the Connecticut seed has been sun-grown in Ecuador, allowing the tobacco to build a dark and oily exterior to protect itself from the sun's heat. The result is a dark, oily, and reddish appearance, offering a heavier, more intense version of the classic Davidoff cigar. A sun-grown Connecticut wrapper is a rare sight in the world of premium cigars, and Davidoff only releases Colorado Claro cigars as enough tobacco supply becomes available. Enthusiasts can expect a medium/full body, showing deep, yet punchy flavors of black and red pepper, roasted nuts, earth, cinnamon, cedar wood, and a clean sugar cane sweetness.